Can Democrats Win In Georgia And Texas? Democrats are planning to make big gains in the 2018 elections. Among the states they are targetting are the increasingly purple, but still reddish, Georgia and Texas. In Georgia, Democrats have nominated former State Rep. Stacey Abrams as their candidate for governor. Abrams was endorsed by various national Democrats including Bernie Sanders, Cory Booker, and Kamala Harris. She would be the first African-American female governor if she wins and is strongly backed by the progressive base. In Texas, Democrats have nominated Dallas County Sheriff Lupe Valdez. Valdez is the first lesbian, Hispanic female candidate for governor in Texas history. She defeated the more moderate Andrew White. They’re also targeting first-term U.S. Senator Ted Cruz. The Democrats in both states chose poorly. Both Stacey Abrams and Lupe Valdez are way too far-left for their states. Does this mean that they will both lose badly? Not necessarily. Both women have a greater than zero chance of winning, but they will need a lot of luck. Let’s start with Georgia. That race is not fully developed yet. Republicans Lt. Governor Casey Cagle and Secretary of State Brian Kemp are squaring off in the runoff to decide which one will face Abrams. On Tuesday night, Cagle got 38.95% of the vote to Kemp’s 25.52%. Cagle will likely try to paint Kemp as too far to the right to win in November. Cagle will exploit Kemp’s failings as Secretary of State such as the release of Social Security numbers of millions of voters. On the other hand, The Hayride spoke to a Georgia reporter off the record. They said that conservatives and Republicans would not be enthusiastic about a Cagle nomination. They also believe that most of the primary vote will now coalesce behind Kemp. Both Cagle and Kemp are flawed candidates to take on Abrams. But you go to war with the candidates you have, not the ones you want. Abrams has shown no inclination towards running towards the center. The day after she won the nomination, Abrams declared herself part of the “resistance” on MSNBC. She is also campaigning on a progressive platform that is designed to appeal to minority and white liberal voters. She believes she can win by activating and registering blacks who normally don’t vote. It will be tough for Abrams to win. For starters, 55,000 more people voted in the Republican primary than in the Democratic one. The state is still Republican-leaning and Abrams is clearly out of step with the state. Republicans have to be favored to hold, but it will be a tough fight. Now let’s turn our attention to Texas. This tweet from Dallas Morning News editorial writer Jay Caruso should sum up Democrats chances in the Lone Star State. A governor with 56 percent job approval and a campaign war chest of $43 million doesn’t lose a bid for re-election. Greg Abbott is that governor. But we’re going to throw a little more dirt on Lupe Valdez’s political grave anyway. Valdez is pro-abortion and pro-open borders. She also frowns upon the beliefs of conservative Christians. Valdez is going to be Wendy Davis 2.0 with less money. Abbott should be easily reelected and will likely pull Ted Cruz over the finish line if he has any problems. 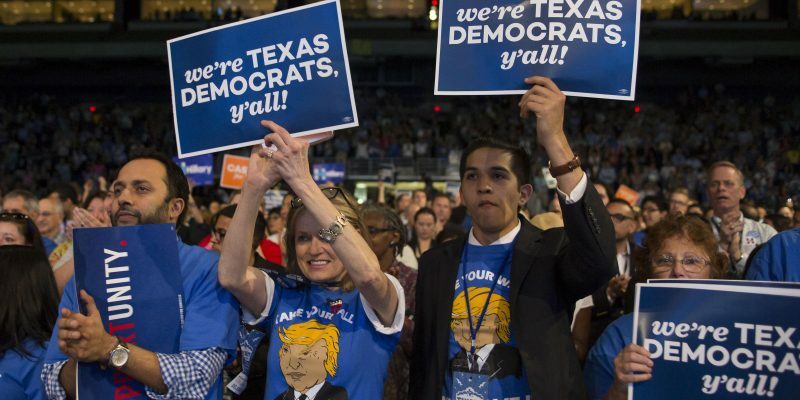 Texas Democrats would be better off trying to go after the less popular Lt. Governor Dan Patrick and Attorney General Ken Paxton. Democrats threw away opportunities in both Georgia and Texas by opting for far-left candidates. If they keep doing this across the country, Republicans will surely benefit.